Very likely the coolest music accessory of the decade, the Korg TMR-50 is a combination digital tuner, digital recorder and a configurable metronome. Perhaps more to the point, it’s a masterwork of convenience, with each of its functions flawlessly executed and intuitively crafted to make the whole works an extension of your fingers. Nothing the TMR-50 does could be considered new or remarkable, but it does it all so well. 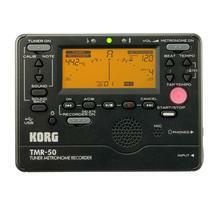 The digital tuner function of the TMR-50 is reminiscent of the ubiquitous tuners Korg has made since the dawn of time. It can listen to whatever is to be tuned through its internal microphone or through a quarter-inch jack in the side of the device, for instruments that find themselves availed of pickups. It has an oversize display and an optional orange backlight to allow it to be used under less than optimum conditions. Smokey dives during hours so small as to require a microscope to reliably locate them won’t trouble it unduly. Power up the tuner and its LCD panel will display a convincing simulation of an analog tuning meter. It also features LEDs to indicate whether it’s hearing a note that’s flat, sharp or bang on. Unlike lesser tuning devices, the TMR-50 has a singular ability to determine the pitch of whatever it’s hearing, even in complex instruments such as reeds or distorted guitars. It spends a minimum amount of time hunting for the right note, and it’s pretty much impossible to confuse. The tuner can be calibrated to pitches other than A440, should you be playing along with something old, weird or non-adjustable. It can play an audible reference tone, for purists who insist on tuning by ear. The metronome function of the TMR-50 is elegantly simple, with a few hidden features to extend its capabilities. Light it up, set the tempo and bang on its Start/Stop button to have it begin playing. You can also tap a specific rhythm into it, and let it repeat that. More sophisticated controls in the metronome section of device allow for different time signatures and patterns. The LCD display panel of the tuner simulates a swinging pendulum when the TMR-50 is serving as a metronome. The tap button blinks in time with the beat it’s playing. I suspect it might be capable of hypnotizing the unwary. The digital recorder function of the TMR-50 could be its best trick. It will record up to twenty minutes of high-quality 44.1 kilohertz, sixteen-bit digital audio, allowing for one hundred separate tracks… albeit fairly brief ones, if you use them all. The recorder features simple, unequivocal tape-recorder controls to start, stop and rewind a recording. It can play its recordings back through the internal speaker of the device. Admittedly, this isn’t a hugely substantial reproduction device. It will also play back through a set of headphones plugged into the TMR-50. The nicest feature of the recorder, however, is the USB port on the side of the TMR-50. Connect this device to a computer and it will look like a flash drive. Its WAV audio files can be copied to your hard drive and played through your system’s speakers. The recorder function of the TMR-50 is exceedingly handy if you feel like practicing against previously recorded riffs. It’s also a supremely convenient digital memo pad, to record bits of music during moments of inspiration. The TMR-50 includes a nuanced set of convenience features. It will remember its various settings between sessions. It knows enough to shut itself off if it hasn’t done anything after twenty minutes of idleness. It can be configured to know which battery chemistry it’s using, so it can reliably predict when its about to run out of power. It’s illuminated by two AAA batteries. Finally, the whole works weighs next to nothing, rests comfortably in the average human hand and seems reasonably robust. With a street price of about eighty dollars, it’s not even particularly expensive. There are unquestionably apps that will allow your smart phone to perform every function of the Korg TMR-50, and perform them with the traditional inconvenience, awkward user interface and unreliable funkiness of a cell phone trying to be something it wasn’t designed for. The TMR-50, by comparison, does what it does masterfully. On those occasions wherein you want to play your guitar, rather than play with your technology, it this is unquestionably the device to connect it to.